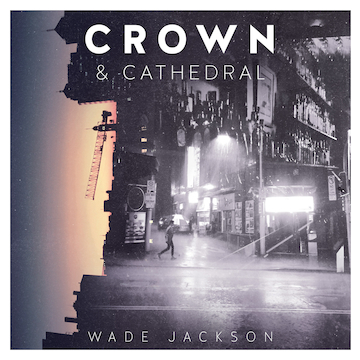 Album Review: Wade Jackson, "Crown & Cathedral"
Once again, Australian pop master Wade Jackson returns with a brand new album and a different direction. Nearly two years after his shimmering pop masterpiece, Whiskey Alpha Delta Echo, he delivers something in a “newer” or more “modern” pop vein and adds a definitive danceable/groove vibe to the elements. Crown & Cathedral is, yet again, another leap forward for this multi-instrumentalist wonder. The ethereal nature of “Someone Else’s Dream” sets the tone with rich soundscapes and underlying melodies that power along the multi-layered vocals in an exquisite fashion; “Before It Gets Too Cold” reminds me in the most wonderful way of pop-genius-legend Van Duren, with its piano-driven body and vocal which breaks you out of its hypnotic trance into an almost-prog ’70’s synth groove and “Believe” is that perfect melding of Van Duren and Todd Rundgren – listening to this track makes me yearn for my youth (!) and the guitar solo is pure ’76. “Exist” is a beautiful piece of instrumental richness – again, layered, warm and colored in a way that recalls the “easiness” of the ’70’s – it’s obvious on this album where Mr. Jackson was looking for inspiration; “Grand Plans (Theme For Ollie)” is a synth-groove with some very Jeff Beck (think There & Back), albeit brief; “She Burn” we premiered a few months ago – a trippy trance-like piece and “The Movie Song” is another “space”/”chill out” piece but with on-the-one vocals. So it’s clear that Wade Jackson likes to move forward and progress with his music – from Beach Boys influences earlier to Big Star/Byrds and now to the best elements of the 1970’s, his is the material that can easily show you how it should be done in these modern times. No doubt Mr. Jackson has brought it home, yet again.